These are very often seen from quite a distance. Many times you will find these on the darkest, almost black, logs of dead deciduous trees. 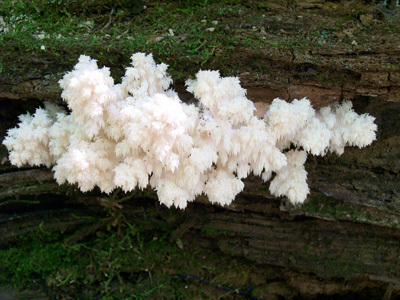 You will be walking through the woods and it will look like someone nailed a white piece of paper to tree or old snag and as you walk closer to investigate you will see it as being the Comb Tooth - Hericium coralloides. I've seen little specimens, such as the one in my hand in the photo lower down, from over a hundred yards away in the forest gloom. It's as if the mushroom is signaling, "Hey, over here" ! ( mushroom scents - now there's a subject for a book. Do you even know what 'fruity', 'mealy' or 'unripe olives' smell like? ), etc., etc. When you see the little spines on these you know you have a safe edible. Here is one I am holding so you can get an idea of the sizes involved. They do get bigger however than the one I'm holding. The smaller ones are the younger ones and therefore the fresher ones for eating. Several branching arms terminating in clusters of spines sticking out. 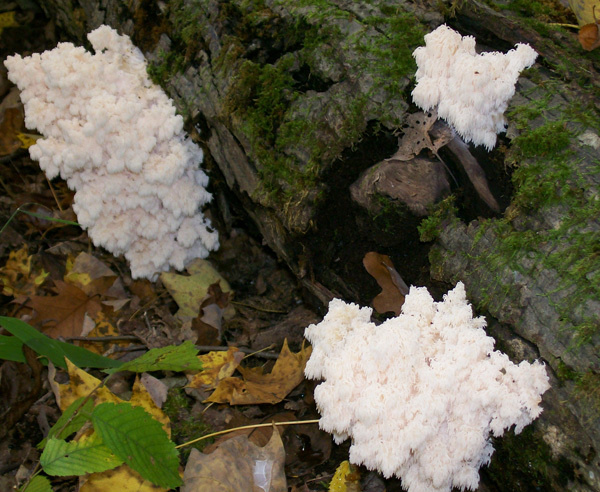 Grows on live deciduous trees ( preferably beech - as a parasite) and old downed trees and branches ( as a saprophyte). White when fresh slowly turning pinkish/brown upon aging. Here are three excellent specimens. Best practice is to cut off the cluster as close to the tree or branch as possible so as not to separate the various branching arms thereby keeping it all in one chunk. A larger knife will be a benefit. Remember the spot where found. It will probably appear for several years if the conditions are still favorable. Scientific studies indicate that this mushroom group - Hericium - has a factor that increases nerve activity and cognitive ability. Also a chemical derived from it has a toxic effect on round worms. Further studies are underway for obtaining a medication to help in the treatment of Alsheimer's disease. 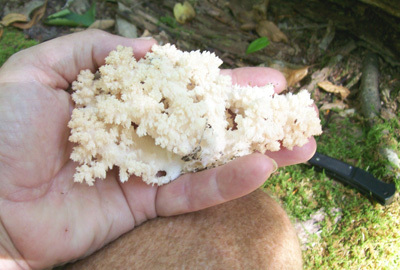 Hericium coralloides ( sometimes Hericium ramosum ) - A/K/A - Comb Tooth. DATE - September 15 and September 26. FOUND - Laurel Hill State Park - near Bakersville, Pennsylvania. growing along a large downed and unidentifiable tree, looked like it may have been an old beech from the general size and shape and the numerous other Beech trees in the vacinity. Weather conditions: Dry. The two weeks prior to finding this one our area was more on the dry side.